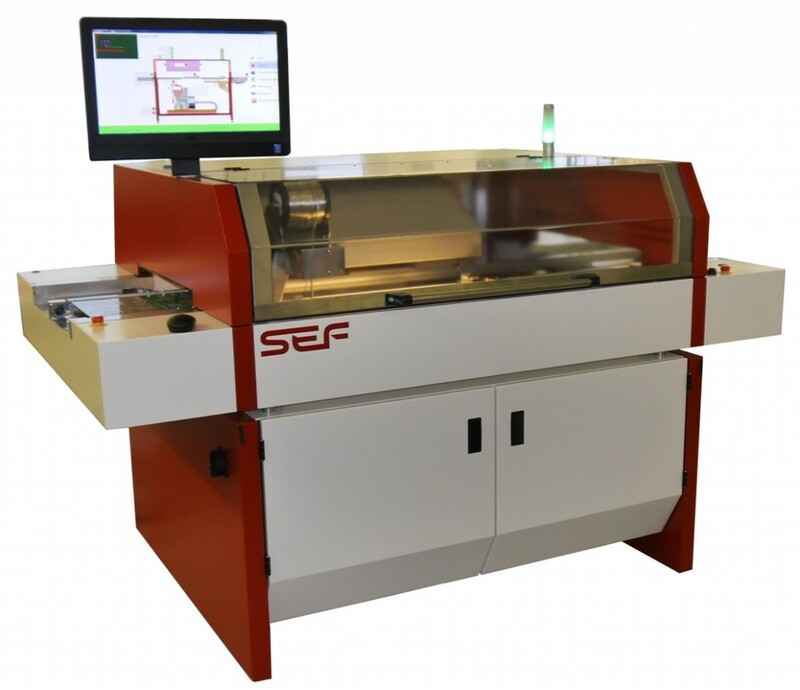 The 640.20 is a full-automatic selective soldering system for small and middle sized production lots. The system is operated with the help of a PC with a graphic user interface. The programming of the solder joints can be easily done with a picture of the PCB and marking the required solder joints. Alternatively you can also use Gerber data. Offline programming is available at any time. The maximum PCB size is 510 mm x 510 mm. The feeding of the PCBs takes place via a pin chain conveyor. Thereby the 640.20 can be used in batch mode (PCB feeding and discharge from the same side) or in inline mode (PCB is passing through the system). A SMEMA interface is available for the communication with upstream or downstream devices. A drop-jet dosing valve ensures the flux fill-up with high positioning accuracy. A light barrier is monitoring the presence of the flux stream. Afterwards the flux will be activated with the help of a preheating module with quartz glass IR heaters. The soldering is provided by a low-maintenance electromagnetic pump and wettable solder nozzles under the supply of nitrogen. The soldering nozzles are available with different diameters. The movable solder pot has a controlled volume of 10 kg. If necessary more solder will feeded automatically. The soldering can be watched with the help of a camera and a monitor. A lamp pole shows the status of the machine.